Roger Williams To John Winthrop. For his much honored Mr. Governor, and Mr. Winthrop, Deputy Governor of the Massachusetts, these. Sir,—the latter end of the last week I gave notice to our neighbor princes of your intentions and preparations against the common enemy, the Pequods. At my first coming to them Canonicus (morofus aque ac barbarex fenex) was very sour, and accused the English and myself for sending the plague amongst them, and threatening to kill him especially. Such tidings (it seems) were lately brought to his ears by some of his flatterers and our ill-willers. I discerned cause of bestirring myself, and staid the longer, and at last (through the mercy of the most High) I not only sweetened his spirit, but possessed him, that the plague and other sicknesses were alone in the hand of the one God, who made him and us, who being displeased with the English for lying, stealing, idleness and uncleanness, (the natives' epidemical sins,) smote many thousands of ourselves with general and late mortalities. 1. They conceive that to do execution to purpose on the Pequods, will require not two or three days and away, but a riding by it and following of the work to and again the space of three weeks or a month, that there be a falling off and a retreat, as if you were departed, and a falling on again within three or four days, when they are returned again to their houses securely from their flight. 2. That if any pinnaces come in ken, they presently prepare for flight, women and old men and children, to a swamp some three or four miles on the back of them, a marvelous great and secure swamp, which they called Ohomowauke, which signifies owl's nest, and by another name, Cuppocommock, which signifies a refuge or hiding place, as I conceive. 3. That therefore Nayantaquit, (which is Miantunnomue's place of rendezvous,) to be thought on for the riding and retiring to of vessel or vessels, which place is faithful to the Narragansetts and at present enmity with the Pequods. 4. They also conceive it easy for the English, that the provisions and munitions first arrive at Aquedneck, called by us Rhode Island, at the Narragansett’s mouth, and then a messenger may be dispatched hither, and so to the bay, for the soldiers to march up by land to the vessels, who otherwise might spend long time about the cape and fill more vessels than needs. 5. That the assault would be in the night, when they are commonly more secure and at home, by which advantage the English, being armed, may enter the houses and do what execution they please. 6. That before the assault be given, an ambush be laid behind them, between them and the swamp, to prevent their flight, &c.
7. That to that purpose such guides as shall be best liked of to be taken along to direct, especially two Pequots, viz. : Wequash and Wuttackquickommin, valiant men, especially the latter, who have lived these three or four years with the Narragansetts, and know every pass and passage amongst them, who desire armor to enter their houses. 8. That it would be pleasing to all natives, that women and children be spared, &c.
9. 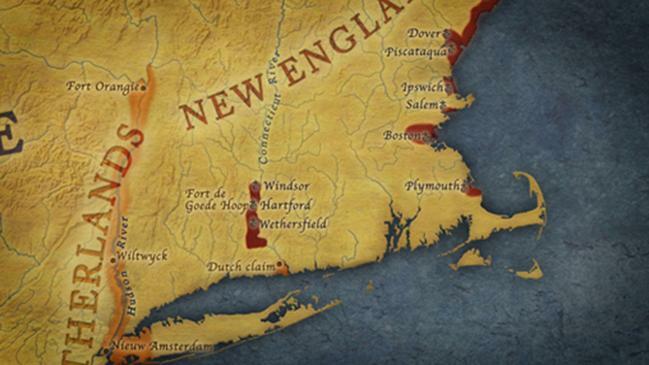 That if there be any more land travel to Connecticut, some course would also be taken with the Wunhowatuckoogs, who are confederates with and a refuge to the Pequods. Sir, if any thing be sent to the princes, I find that Canonicus would gladly accept of a box of eight or ten pounds of sugar, and indeed he told me he would thank Mr. Governor for a box full. 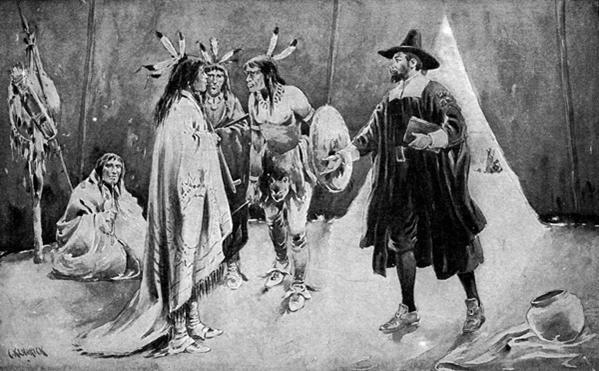 Not only did the persuasions of Williams induce the Narragansett to refrain from forming an alliance with the Pequods, but he succeeded also, as we have already learned, in committing the former to a friendship with the Bay people, and a continued hostility to their old enemies, the Pequods. In the summer of 1637 a party of Narragansett succeeded in overpowering a company of Pequods and killed three. Following their barbarous habit a hand of each was cut off and the three hideous trophies were sent to Boston. One of those who fell was the leader of the party of Pequods who murdered Stone and Norton, four years before. May 25.] Our English from Connecticut, with their Indians, and many of the Narragansetts, marched in the night to a fort of the Pequods at Mistick, and, besetting the same about break of the day, after two hours’ fight they took it, (by firing it) and slew therein two chief sachems, and one hundred and fifty fighting men, and about one hundred and fifty old men, women, and children, with the loss of two English, whereof but one was killed by the enemy. Divers of the Indian friends were hurt by the English, because they had not some mark to distinguish them from the Pequods, as some of them had. Presently upon this came news from the Narragansetts that all the English, and two hundred of the Indians, were cut off in their retreat, for want of powder and victuals. Three days after, this was confirmed by a post from Plymouth, with such probable circumstances, as it was generally believed. But three days after, Mr. Williams, having gone to the Narragansetts to discover the truth, found them mourning, as being confident of it; but that night some came from the army, and assured them all was well, and that the Pequods were fled, and had forsaken their forts. The general defeat of the Pequods at Mistick happened the day after our general fast. June 3.] Upon the news from Mr. Williams, that the Pequods were dispersed, and some come in and submitted to the Narragansetts, (who would not receive them before he had sent to know our mind), the governor and the council thought it needless to send so many men, and therefore sent out warrants only for one half of the two hundred; but some people liked not of it, and came to the governor to have all sent. He took it ill; and though three of the ministers came with them to debate the matter, he told them, that if anyone, discerning an error in the proceedings of the council, had come, and a private manner, to acquaint and therewith, it had been well done; but to come, so many of them, and a public and popular way, was not well, and would bring authority into contempt. This they took well at his hands, and excused their intentions. So it was thought fit to send about forty men more, which was yielded rather to satisfy the people, and for any need that appeared. Upon our governor’s letter to Plymouth, our friends there agree to send a pinnace, with forty men, to assist in the war against the Pequods; but they could not be ready to meet us at the first. 15.] There was a day of thanksgiving kept in all the churches for the victory obtained against the Pequods, and for other mercies. Sir, I am much desired by Yotaash (the bearer hereof, Miantunnomue's brother) to interpret his message to you, viz. : that Miantunnomu requests you to bestow a Pequot squaw upon him. I object, he had his mare sent him, he answers that Canonicus received but a few women and keeps them: and yet he saith his brother hath more right: for, himself and his brother's men first laid hold upon that company. I object that all are disposed of, he answers, if so, he desires to buy one or two of some Englishman. I object that here are many run away, which I have desired himself might convey home to you: he replies, they have been this fortnight busy (that is keeping of a kind of Christmas): and secondly, at present Miantunnomue's father-in-law lies a dying: as also that some of the runaways perished in the woods; three are at the Narragansett, and three within ten miles of this place; which I think may best be fetched by two or three Massachusetts Indians who may here get some one or two more to accompany and help. Much Honored Sir, — I was bold to present you with two letters by Thomas Holyway, some weeks since. I am occasioned again at present to write a word by this bearer Wequash: whom (being a Pequot himself,) I commended for a guide in the Pequot expedition. I presume he may say something to yourself, or to such other of my loving friends as may report unto your worship, what befell him at Cowefet. He hath been five or six days now at my house, in which time I have had much opportunity to search into particulars, and am able to present you with naked truth. He came from Monahiganick to Cowefet within night and lodged with his friend called Pananawokshin. 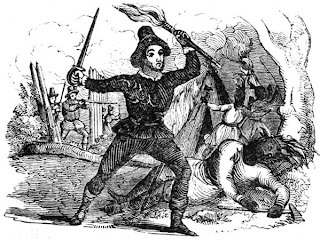 At Cowesit, an old man (Weeokamin,) hath made great lamentation for the death of two sons in the Pequot wars. This Weeokamun with divers of his comforts in the night time laid hold upon Wequash, intending to bind him, charging him with the death of his two sons. Much bickering there was between them, but no hurt done, only Weeokamun struggling with one of Wequash his company was fore bitten on the hand, and also bit the young man's fingers which are well again. So that their host kept peace in Canonicus his name, and brought them safe to me the next day: yet in the fray they loft a coat and other small things, which (coming forth before day) they left behind them. 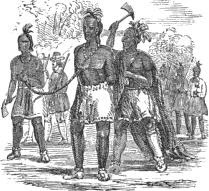 I sent up a messenger to the Sachems to demand a reason of such usage and their goods. Canonicus sent his son, and Miantunnomu his brother (Yotaash) who went to Cowefet and demanded the reason of such usage, and the goods, and so came to my house, causing the goods to be restored, professing the Sachem’s ignorance and sorrow for such passages, and given charge to all natives for their safe travel. Having those messengers and Wequash at my house, I caused them solemnly to parley of what I knew was grievance betwixt them, and what else I could any way pick out from either of them, concerning ourselves the English, or the Pequots, or themselves. All which I carefully writ down the particulars, and shall readily, at your worship’s pleasure, acquaint you with them: either concerning some squaws which Wequash acknowledged he parted with (and justly) to Canonicus and Miantunnomu, or other brablings which I thought not fit to trouble your worship with, without commission.